AUBURN HILLS, MI -- (MARKET WIRE) -- August 29, 2006 -- Genesis Homes, a member of the Champion family of homebuilders (NYSE: CHB), and the largest nationwide builder of modular homes, today announced it has been selected by NOLA to build a modular home for use in temporary housing proposals to FEMA. The bungalow-style homes will provide unmatched durability and a 150 mph wind rating, features which are superior to those on shelters supplied by FEMA to date. As the Government explores new temporary emergency housing solutions for future disasters under a $400 MM test program, NOLA hopes to replace FEMA-issued travel trailers and mobile homes with the durable and high-quality NOLA Bungalow which can be used many times over by FEMA. "I chose Champion's Genesis brand due to its superior quality, design features and the comfort, convenience, and quality of life the construction provides to post-disaster victims," said Troy Von Otnott, NOLA chief executive officer. "This product supplies features that are not available in any other FEMA-supplied options." The 455-sq.-ft. home was unveiled to city, state, federal officials, Government contractors and the public on August 28 and 29 in New Orleans. It includes two bedrooms, one full bath, efficiency kitchen, dining and living rooms. 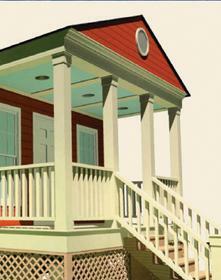 A front porch is included for architectural design detail. The home will be available for public viewing through November 2006. "Champion, through its Genesis brand, offers NOLA multi-plant capacity to meet large volume requirements, as well as options for single and multi-family projects," says Kevin Flaherty, vice-president of sales and marketing for Champion's Genesis Homes. Beyond Genesis' superior construction is the Telepier™ temporary foundation system, which can be installed by three people in four hours and provides wind rating of 150 mph. Once the occupant has found permanent housing, the highly durable home can be removed or relocated. "We are very pleased to work with NOLA on this project," said Kevin Flaherty. "It is extremely gratifying to offer the best features of permanent construction in a solution that can be provided quickly to those who need it the most." New Orleans modular home company, NOLA Homebuilder, supplies modular housing to New Orleans and suburban neighborhoods. All housing options are firmly rooted in the New Orleans architecture tradition and incorporate the latest energy saving building technologies. Please visit www.nolahomebuilder.com for more information. Auburn Hills, Michigan-based Champion Enterprises, Inc. is a leader in factory-built construction, operating 36 manufacturing facilities in North America and the United Kingdom, and partnering with over 3,000 independent retailers, builders and developers, including 900 retailers that are part of the Champion Home Center retail distribution network. The Company produces manufactured and modular homes through its family of homebuilders, as well as modular buildings for military and commercial applications. Further information can be found using the company's website, www.championhomes.com.